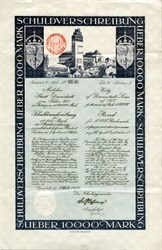 Beautiful uncancelled certificate from the City of Darmstadt issued in 1922. This historic documenthas an ornate border around it with a vignette of city center. This item has the signatures of government officials. Darmstadt is one of few cities in Germany which does not lie close to a river, lake or coast. The chemical element darmstadtium (atomic number 110) is named after it, having been synthesized in the GSI Centre for Heavy Ion Research in Darmstadt-Wixhausen. The name Darmstadt first appears towards the end of the 11th century, then as Darmundestat. Literally translated, Darmstadt means "Intestine City", but this is just a coincidence. The origins of the name are unknown. 'Dar-mund' in Middle Low German is translated as "Boggy Headlands", but it could be a misspelling in local dialect of another name. Even locals often believe, incorrectly, that the name derives from the 'Darmbach' (a small stream formerly running through the city). In fact the stream received its current name much later, after the city, not vice versa. When the house of Katzenelnbogen became extinct in 1479, the city was passed to the Landgraviate of Hesse, and was seat of the ruling landgraves (1567�1806) and thereafter (to 1918) of the Grand Dukes of Hesse. Some prominent members of the German resistance against the Nazis were citizens of Darmstadt. These include Wilhelm Leuschner and Theodor Haubach, both executed for their opposition to the regime. Darmstadt was first bombed on 30 July 1940, and 34 other air raids would follow. The old city centre was largely destroyed in a British bombing raid on 11 September 1944. This attack was an early use of the firestorm technique � subsequently used on the city of Dresden in February 1945 � where a number of incendiary bombs are dropped around the city before explosive blast bombs are dropped to begin a self-sustaining combustion process where the winds generated by the fire ensure it continues to burn. Darmstadt was selected as the secondary target for the raid, but promoted to primary target after clouds were observed over the primary which would have hindered any reconnaissance of the after-effects. During this worst attack an estimated 11,000�12,500 inhabitants died, and 66,000�70,000 were left homeless. Over three quarters of Darmstadt's inner city was destroyed. Post-war rebuilding was done in a relatively plain architectural style, although a number of historic buildings were rebuilt in their original styles after capturing the city in 20 March 1945 by 4th American Armored Division. Darmstadt is relatively typical for German cities in terms of its transport system, with the car being the main, but not overwhelmingly dominant mode of transport. Darmstadt is connected to the surrounding areas by a number of major roads, primarily accessing the areas to the north, west and south, including two Autobahn links crossing just west of the city as well as a Bundesstra�e also running north-south. The less settled areas east of the city in the Odenwald are accessed by several secondary roads. Darmstadt Hauptbahnhof is its main station, located at the western end of the central city and connects to the rest of Germany and Europe with the Intercity-Express network. There is also a much-utilised line S 3 of the Rhine-Main S-Bahn north to Frankfurt am Main and a number of suburban stations on the Main-Neckar Railway and two less important local rail lines, the Rhine-Main Railway to the east and the Odenwald Railway to the east, including Darmstadt Nord station.